In reading @jesse_livermore’s latest and always brilliant missive/analysis, he referenced and linked to a study by Arizona State University professor Hendrik Bessembinder entitled “Do Stocks Outperform Treasury Bills?” It seems like a pretty ludicrous question since our capitalist system is supposed to reward risk takers. With stock market investors owning the equity of the listed companies and correspondingly the highest risk since they are in a first loss position, then it should come as no surprise that they should have the highest reward. As a result, they should easily beat risk-free returns. But sometimes the hand is quicker than the eye so not so fast kemosabe. Bessembinder’s study is one of the most impactful pieces of research I have read in a long time. The depth of analysis and findings are so informative and surprising that it will definitely impact how I deploy money in the stock market and helped me understand why real estate, particularly housing-related real estate, can perform well over long periods of time. Munger always says to invert and this study has forced me to do that. If you want to know why something does well, then first study what does poorly so you can learn why it does and avoid that. The principal reason for the poor returns is the short shelf life of individual common stocks. The median time that a stock was in the CRSP database between 1926 and 2015 was just over seven years. 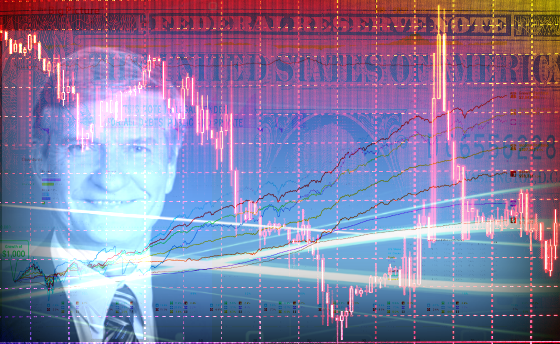 The author tested whether selecting a random, individual stock for each month from 1926 to 2015 would have produced a 90-year holding period return would exceed various benchmarks. The results were shockingly poor. 96% of the single stock simulations underperformed the value-weighted index and underperformed the equal-weighted index 99% of the time. The single stock strategy also underperformed owning T-Bills 72% of the time. The overall stock market is able to generate much higher long-term returns while the majority of individual stocks underperform T-Bills because there is a heavy positive skewness. The relatively few stocks that outperform do so in such a way that they more than make-up for the huge number of losers. Large positive returns are more frequent than large negative returns. The author estimates that $32 trillion of wealth (returns in excess of Treasury Bills) was created between 1926 and 2015 via the approximately 26,000 stocks that have appeared in the CRSP database during that time. Of these 26,000 stocks, only 86 of the top performing stocks (less than 0.33%), were collectively responsible for over half of the wealth creation. And the top 1,000 performing stocks, less than 4% of the total, accounted for all of the wealth creation. The other 96% only matched the return of the one-month Treasury Bill with many of them producing less. 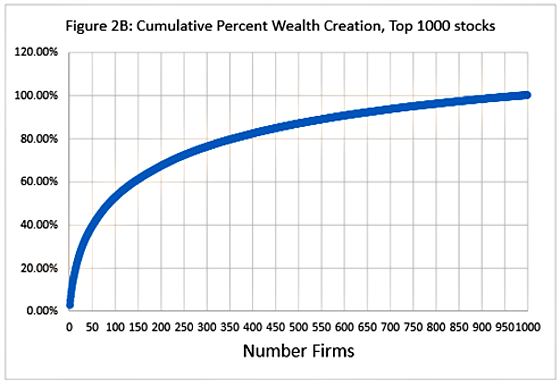 The following chart shows the distribution of wealth creation and how few stocks account for all of the gains. 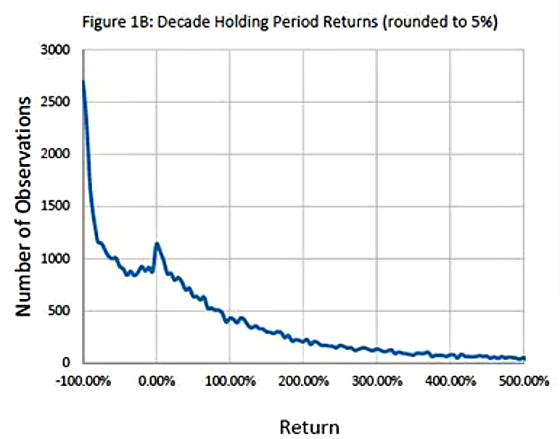 The following chart shows how skewed the returns are for decade holding period returns. 49.2% of stocks underperformed Treasury Bills. Large capitalization stocks had much more staying power and consequently a much better chance of beating Treasury Bills over a decade as the following table shows. The table shows that the percentage chances of having positive returns and then outperforming T-Bills increase quite significantly as the size of the company grows. The skewness drops as well. This means that there is a more even distribution of returns. With the smaller capitalization stocks, the high positive skewness means that much of the positive returns are the result of relatively few stocks. Despite the improving returns as the capitalization increases, there is still underperformance relative to the value and equal-weighted indices constructed by the author. Apartments serve a basic need that will always be required. It is very difficult for apartments to be disrupted into obsolescence or being non-competitive. While the average stock had a shelf life of seven years, apartments that are well located and maintained can have a useful economic life for hundreds of years if Europe is any indication. And if what is on a valuable site does become sub-optimal then the property can be purchased for the appreciated land value and be re-built. The population will continue to grow. Barrier to entry locations can be purchased which helps long-term pricing power due to manageable competition. There is ultimately enough discipline in the capital markets to restrict lending and equity investment when the asset class is overbuilt. This makes staying power key. It’s a leverageable asset, although this can also hurt returns if one does not have the staying power to support one’s investment during the tough times. Rents are generally correlated with economic and income growth which should continue to grow over time. It produces yield which is an indisputable return and one that is often times at a higher rate than Treasury Bills. Thus, there is usually an outperformance and positive return head start that should remain in place during the holding period and has good growth prospects. This study has convinced me to stay the course when it comes to deploying most of my capital into apartments, particularly because I understand the asset class pretty well and there is a very strong and competent organization capable of managing the assets through all cycles. When it comes to investing in the market, I’m sure it will remain a relatively small part of my asset allocation but the capital I do put into it will be focused on higher quality companies via diversified funds. The positive skewness really stood out for me in the research done in this study which has led me to conclude that I’m probably not well suited for picking winners and nimble enough to rid myself of those destined for the dustbin of history quickly enough to avoid meaningful losses. 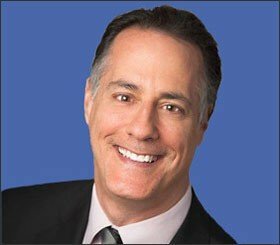 I would rather invest in an asset, like apartments, in which the average return is positive over a long period of time, throws off dividends, has decent growth prospects, and some excellent tax benefits. For my money, that is a hard combination to beat. Now that you’ve seen the Bessembinder study do you agree that it’s a hard combination to beat? ‹ It’s Got to Get Better in a Little While…Or Does it?